Well, this blog isn’t about Bible reading or biblical literacy and I’m not going to be getting into Bible study methods or practices. But when it comes to worship, the Bible ought to play a central role too. For some of us, that’s a new idea. We’re used to the idea of the Bible for study, for seeking out truth, for guidance. But the idea of the Bible as a vehicle for worship, for communicating our heart to God, and hearing His, even for having an experience of God, that seems less concrete. With that in mind, from time to time I’m going to give you some ideas about how you might use the Bible in your personal worship, in ways that are different than just reading the text. Some of the ideas may work for you; some may not. Some may seem strange, maybe a little uncomfortable. Others may be just up your alley. But my hope is that you can begin to expand your tool box when it comes to personal worship. In my last post I commented on all the different styles of worship. I compared these to a bunch of different shoes – useful for different purposes, and for getting you where you need to go. But I suggested that the thing that matters most isn’t the shoes, it’s the foot inside and the direction it’s headed. Personal worship is the same way. Scripture reading, Bible study, devotional books – these can all be great for worship. So can drawing, and painting and sculpting. So can journaling, reflecting, praying, prayer walking, and a thousand other things. What matters is that you are giving God glory – weight and significance in your heart – and that you are communicating that back to Him. So take some of these ideas for a spin and see if they work for you. The first idea I want to share with you is to write your own Psalm. This worship activity works great for an individual in private worship or in a small group setting. First, get everything you’ll need together. Get yourself in a thoughtful space. Somewhere you can write comfortably, and won’t be disturbed for twenty minutes or more. You’ll need a notebook or journal. I recommend having a nice quality journal that you use for your worship time. I use Moleskines. They’re great quality, and they feel significant – not like a throw-away paper-back, or spiral notebook. You’ll also need something to write with. I’m kind of a pen nerd. Nice pens that write smoothly with just the right touch and ink matter to me. A good pen makes the process of writing longhand more enjoyable. Presently, my pen of choice is the fat Sharpie Pen. If you’re really aesthetic, light a candle and dim the lights. For some people this helps shape the mood a lot. It’s not necessary for me, but I have friends that it’s really important for. One note before I move on – the above steps are good preparation for any journal-based worship, not just this one. You ought to have the things you need for worship at hand. A good Bible. A journal. A pen. If worship is going to be a habit for you, it will be easier if you have these things at hand. That’s one less hurdle to get in the way. All right… moving on. First, Ask for God’s involvement. One of the mistakes we often make when we come to scripture is to assume that God will speak to us. It’s God’s word, right? Well, it is, but God doesn’t often speak to hearts that aren’t open. (Or at the very least, hearts that aren’t open can’t hear.) So, make sure your heart is ready. Pray and ask God to speak to your heart in this time. Give Him access to shape you through scripture. Ask to receive the promise that the Holy Spirit will guide you into all truth. Second, Pick a Psalm. For a small group activity, you might provide a certain Psalm for everyone to work from. In your own private worship you could just pick a random Psalm, or work through a section of Psalms, doing one every week as a part of your personal worship. The length of the Psalm will impact how long this worship activity takes, so choose one that fits for the time you have to give. Third, Read, Deep read, Reflect. I’m writing this post on a computer that has a twitter feed, facebook and email notifications that intrude at random intervals. In our spare time we choose movies and TV shows far more frequently than reading. As a culture we have moved away from deep reading. We want things direct. 3 bullet points. 140 characters. But that doesn’t work for scripture. Scripture shapes us through exposure. Reading for reflection is the goal. That means reading the passage once, twice, three times. Slowly passing over the words. Savoring them. Thinking about what they might mean. Trying to get emotively into the text – what is the author thinking? What is the audience experiencing? Take your Psalm this way. Read it through all the way, without stopping. Think about the overall sense. It it joyful? Is it sad? Is it more a tone of teaching or a tone of worship? Then read the Psalm again. This time think about the characters involved. Who is speaking? What kind of person do they sound like? Who are they speaking to or about? Don’t read like you’re reading a reference book. Don’t scan. Don’t try to speed read. Read each line. Pause. Let those words sink in. Read the next line. Listen. Fourth, Find your connecting point. Having read the Psalm slowly and thoughtfully, look for where you connect with what is being said. Is the writer expressing joy and celebration? Well, what’s going on in your life that’s worth celebrating? Is the author expressing anxiety, asking for God’s rescue? Where in your life are you feeling alone and in need of God’s intervention? 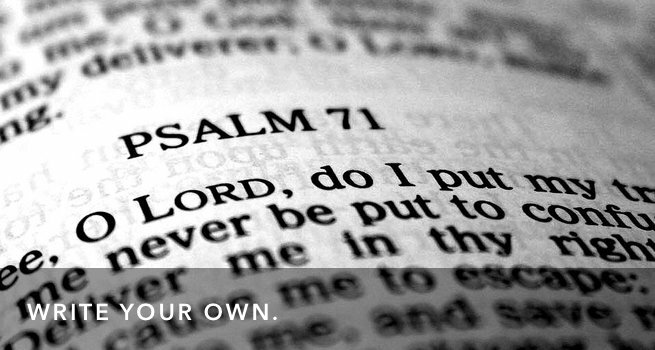 Find the part of the Psalm that speaks most directly to your inner circumstances. That’s going to be your starting point for what you have to write. Fifth, Write your own Psalm. Using your model Psalm as an example, write your own prayer or song. Take it line by line, and let the theme of the Psalm shape your own prayer. If you’re not certain what to write, write the same line but personalize it in your own words and contemporary language. Where it makes sense insert the specifics of your own circumstances or spiritual condition. You are using the template of the Psalm to write your own prayer or song to God. Don’t get hung up on form. Don’t try to make it quality poetry. If you’re a musician, don’t shift over into song-writing mode. Let this flow naturally. Finally, Pray your Psalm. Once you’ve made it through the Psalm, line by line, and have your own version pray it out to God. Speak it out loud. If you’re a musician and you’re moved, sing it out with a simple melody. Repeat it once or twice. Then end with some quiet space of reflection and listening. In your journal jot down thoughts that occur to you. What did this process open up for you about your relationship with God? What did it bring up about God’s character. Do you have any experience with praying the Psalms or using the Psalms as models for your own prayer? How did you do it? What kind of experience did you have?